If you’re serious about making proper pizza, then this complete package is the perfect place to start. It is designed for domestic use but has the feel and quality of a commercial and professional model. The oven will reach 350°C in less than 10 minutes, and is ready for pizzas in just 15 minutes. It can reach a maximum temperature of 500°C. The brick flooring removes any excess moisture from foods such as pizzas and bread, giving a perfect crispy base which can only be achieved using a stone floor and high temperatures. You can also prepare pasta dishes, or use the oven as a barbecue. It comes complete with an open fronted base which features discreet wheels for full transportability around your patio area and weighs only 130kg. The two shelves at the side can fold away to make it more compact during storage. With a built-in temperature gauge and chimney flue, the wood-fired heat can be controlled relatively easily. 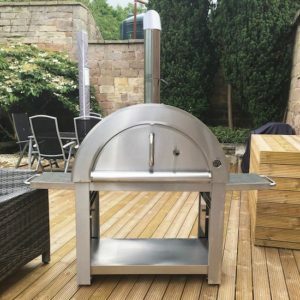 The stainless steel outer will keep it looking new and modern for years to come, and it is less likely to be affected by the weather. 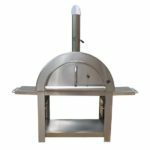 The 80 x 55 cm cooking area can comfortably manage two pizzas at any one time, and as they only take around three minutes until they are ready, you don’t have to worry that it won’t handle feeding a big party. If the thought of needing to buy all of the usual added extras as well as the oven is putting you off, then you’ll be pleased to hear this bundle includes everything you need to get going straight away – there’s a cover, pizza peel, embers rake and even a cookbook. It may be expensive, but other reviewers rate it as one of the best pieces of kit they have ever bought, and we would have to agree.